When I think about Mingyu (my favourite! ), I always think about her in the red wedding dress, the wedding that never happened and that pair of scissors that ended it all. So I thought of doing a small tribute piece on the traditional Chinese wedding with a slight twist. It’s often taken for granted that Chinese weddings have to be red everywhere–red packets, red dresses, red decorations etc. But if you look at history, it was not until the Ming dynasty (sometime around 13th Century) that women started wearing red for weddings, and only around the Qing dynasty (sometime around 17th Century) that both men and women wore red for weddings. So what did women wear in the past to get married then? 2,000 years ago, Black was the vogue colour, so black and slight linings of red would be worn. The interesting term that was used for red was not what we call it today, it was a special word which referred to the colour of the sun before it sets, so it’s more of an orangy red. The terms which were used to describe colours in the past were extremely poetic, often closely associated with natural phenomenon and mysticism. Of course, the terms would also change in different periods to refer to slightly different colours. Then after the Han dynasty in about 220 CE, apparently white was the vogue colour for wedding. Yes, Queen Victoria inspired the white gown craze of today, and if you wish to convince your Chinese parents on the validity of wearing white for wedding, look no further than 1800 years ago’s Chinese wedding dress. Then there was the green wedding dress of Tang dynasty and finally, it was red. So.. white wedding dress? So last^2 millennium. Then there are the wedding candles. If you were gifted with a pair of scissors for wedding. DO NOT STAB THYSELF. Use it to cut the wick of candles. This is an interesting practice which not many might be aware of–that the ancients would trim the candle wick so the fire would continue burning brightly. This is especially when the wick got too long and would split at its ends if left untrimmed, which affects the fire. It was said that the origin/mythology surrounding the lighting of candles for wedding came from the Ancient Dynasties period (about 4300 years ago), where Emperor Yao fell in love with a deer nymph who carried the spark of fire. He found her at a mystical cave and just as he was about to approach her, a huge python appeared. He freaked out at the sight, while she just used her magical powers to dispell the python, saving him from further embarrassment (ok, I added this part myself, but it’s true right…). Anyway, on the night they got married, a ball of fire suddenly ignited at the top of the cave (Oh yea, the Chinese invented fireworks, maybe this was their inspiration at some point). Henceforth, people started burning candles to represent this ball of fire at wedding nights, and the wedding chamber is also known as the cave-room (洞房) in Chinese. 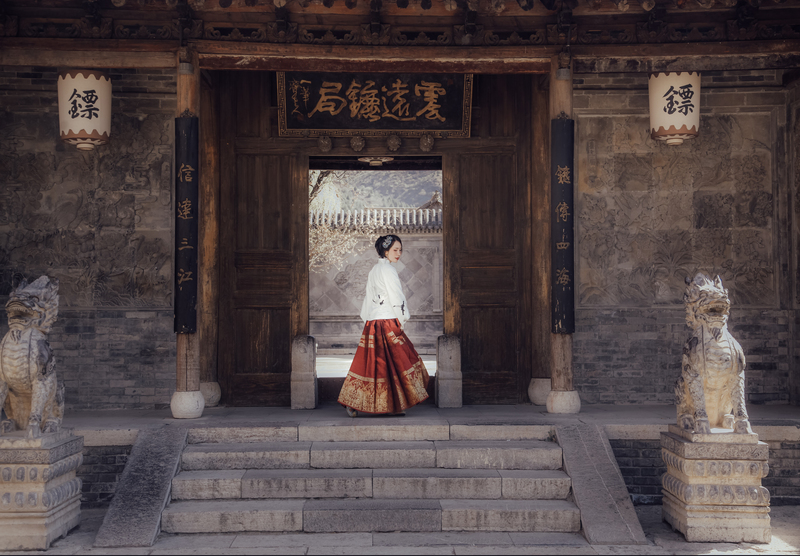 Of course in the show, Mingyu didn’t change into her full wedding attire, because as you might have seen from Qing dynasty photos, they would often wear really elaborate head crowns. I imagined how she might’ve looked had she progressed to that stage in life. I made that crown based on this antique crown which Angelababy wore for her wedding. Remember that I mentioned in this article about how many shows mis-represented the Qing dynasty bottom back of hair by using some fake add-ons that stuck out like sparrow tails at the bottom? This is actually how it should look like in late Qing dynasty, with natural hair somewhat sagging down a little to form a bit of volume. But this, possibly was also not accurate to the period of Emperor Qianlong. They probably combed it all up seeing that it was still quite early into the Qing dynasty and the fashion of the Han Chinese women and their elaborate hair hadn’t caught on yet. During the interview, apparently, the director of Yanxi mentioned that even though he was aware that the sparrow-tail back of hair was not historically accurate, he continued with that misconception because he thought people would expect it and that it was for “aesthetic purposes”. I wonder if it was dumping down or indeed true that Qing dynasty women look better with the sparrow tail at the back. As such, I have taken the liberty to edit my image below to have one with and one without the sparrow tail. I am interested to hear what you think! I JUST REALISED I DIDNT REPLY YOU!! I thought I did!! I wanted to say (in my imagined reply) that I am really intrigued by the peony pavilion story, and I actually did a very peony-pavilion-ish kinda of shoot in opera styling last year! Really loved it! I might just do an entry one day with those images! Good idea! BUT I really have a backlog of projects and the list just gets longer!! SO MANY INTERESTING THINGS TO EXPLORE!! SO LITTLE TIME! Soldier on! Hahaha! Gosh, I understand what you mean about a backlog…(though I don’t have projects in this sense–I review ballets but v v slowly so my 1 project takes forever). Hahaha looking forward to the list (with or without Peony Pavilion). The crazy thing is that in the library, there was at least one other book with it that had a similar-sounding title to PP — that made me think of how Twilight or Hunger Games fuelled the fantasy romance/dystopian era (Clockwork Prince / Maze Runner etc) and I wondered if the same thing happened back in the day! But I didn’t check out the other book(s) because my main focus was PP (that volume also contained how young ladies of the day reacted to PP). Black was worn as a Chinese wedding colour ? What’s the reason behind it ? My teacher also mention peranakans having black wedding veils, could this be linked ? Not an expert in peranakan culture but colours were linked to the five elements which is a belief upheld by ancient rulers since 3000 years ago. Black represented the water element which was what emperors 2000 years ago identified as their auspicious element.